The reason why things like this can hurt us so deeply is often nuanced and complicated, but it has a lot to do with how we use the Feeling sides of our personalities. Everyone has a Feeling side (whether or not there’s an F in your four-letter Myers-Briggs® type), and we each use this part of our personality a little differently. Your personality type (INFJ, ESTP, etc) tells you which of 8 mental processes called “cognitive functions” you use, and in what order. If you’re not familiar with the cognitive functions or want to refresh your memory, click here to read a quick and easy introductory guide. If you’re an FJ type, then Extroverted Feeling (nicknamed Harmony) is going to be either your driver or co-pilot process. For FP types, Introverted Feeling (Authenticity) will either be the driver or co-pilot. Feeling types are usually pretty comfortable using their Feeling sides and have greater access to this process for making decisions. 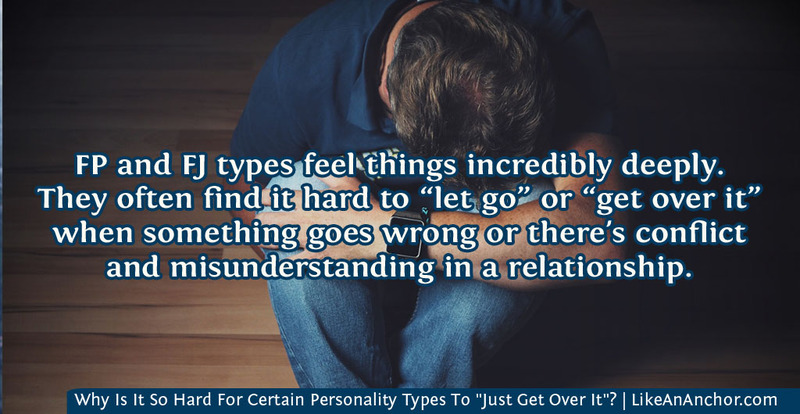 For TJ types, Introverted Feelings will show up either as their tertiary or inferior process. For TP types, Extroverted Feeling is the tertiary or Inferior process. Thinking types aren’t as comfortable using their Feeling sides, but they do have Feeling in their function stacks. Because FP types build their values and process emotions with the introverted sides of their personalities, they’re not always comfortable expressing their emotional side to the rest of the world. However, Introverted Feeling types feel things incredibly deeply. They also understand their own feelings so well that they can “mirror” the feelings of other people (or at least identify what they think others are feeling). Introverted Feeling gives FP types, and to a lesser extent TJ types, a desire to be authentic coupled with an ability to see things from other people’s perspective. For FP types in particular, they might even recognize how someone else is feeling before the other person realizes it themselves. Since FPs are so in-tune with what’s authentic to them and how other’s respond, it can be very hard for them to let go when something goes wrong or there’s a misunderstanding in a relationship. FP types value internal harmony, and when others have a perspective that doesn’t respect their deeply held values it can cause hurt. All the FJ types types crave harmony in their relationships with other people and make decisions accordingly. They might actually feel like they understand other people’s emotions better than their own. Their own feelings run deep, and so do their hurts, but they can have a hard time processing them. Extroverted Feeling gives FJ types and, to a lesser extend TP types, the ability to pick up on what people say, think, and feel about them and others. FJ types in particular care deeply about meeting the needs of others and how their own decisions will affect other people. 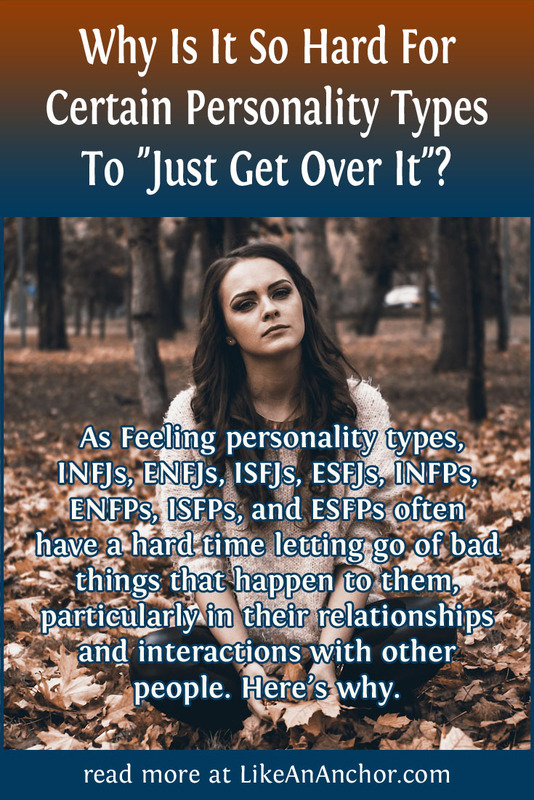 Because FJ types are so tuned-in to what’s going on with the people around them, they’re also very aware of anything that might go wrong in their relationships. When something does go wrong, or even if it just feels wrong, it’s going to affect them deeply. For INFJs, ENFJs, ISFJs, and ESFJs one of the biggest personal growth challenges is learning to use your Extroverted Feeling in a healthy way. You need to realize you can’t always have perfect interactions with everyone, and that’s okay. You also need to include yourself when trying to meet the needs of “everyone.” You’ll want to learn how to create harmony rather than just avoid conflict. And you need to show compassion toward yourself while you’re working toward those goals, not beat yourself up because you have a hard time letting go of the hurt that comes when anything goes wrong in a relationship or human interaction. Similarly for INFPs, ENFPs, ISFPs, and ESFPs, one of their big challenges is finding healthy ways to use Introverted Feeling. You’ll have to learn to accept that people aren’t always going to “get” your personal convictions or agree with you, but that’s okay. You need to find a balance between lining-up with your internal sense of right and wrong and accepting feedback from external sources. You can find ways to process internal negativity without holding onto deep hurts or projecting them onto other people. And you need to show compassion toward yourself while you’re working toward these goals, not beat yourself up for struggling to “get over” things that hurt you. Journal about your feelings. Writing can help you process what has happened, and might also help you come up with some ideas for using this hurt to grow. Find a trusted confidant and talk about what’s going on. Go for a walk, draw a warm bath, spend time with some good friends — whatever helps you take a break from stewing over your hurt. Remember to get enough sleep, eat good food, and give yourself a good balance between alone time and positive socialization. Forgive yourself and others, let go of shame, and find ways to live in and enjoy the present. Talk with a counselor if you’re struggling with suicidal or self-harming thoughts, or even if you just think counseling might be helpful. One of the most powerful things that happens when we learn about our personality types is that we realize there’s nothing “wrong” with how our minds are hard-wired. Being deeply affected by conflict, worrying about how other people perceive you, pondering how you could have been more real in a conversation, or struggling to “let go” or “get over” hurts doesn’t mean there’s something wrong with you. Instead, there’s a good chance you’re a perfectly normal Feeling type who cares deeply about things related to authenticity and harmony (or a Thinking type who’s more in touch with your Feeling side). Do you want to discover your personality type? I recommend the free test from Personality Hacker (click here to take it). Please note that this is an affiliate link, which means if you make a purchase after taking the test I’ll receive a small commission at no additional cost to you. ← What Are God’s Holy Days and Why Would We Care?